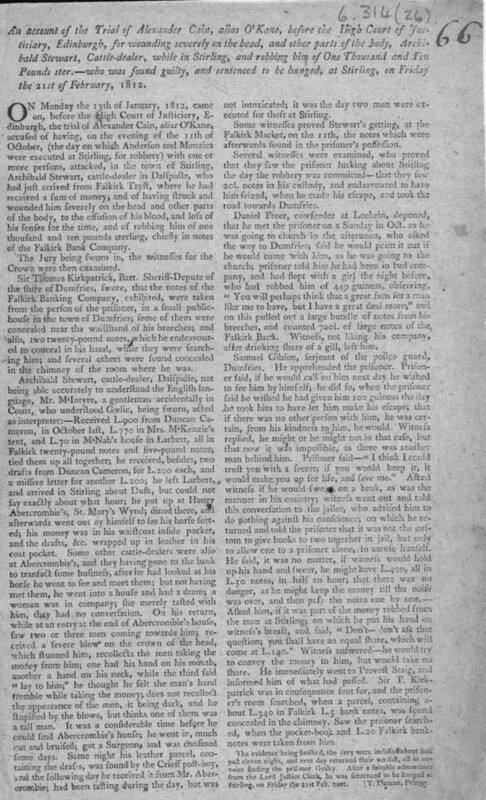 This execution notice begins: 'An account of the Trial of Alexander Cain, alias O'Kane before the High Court of the Justiciary, Edinburgh, for wounding severely on the head, and other parts of the body, Archibald Stewart, Cattle-dealer, while in Stirling, and robbing him of One Thousand and Ten Pounds ster. -who was found guilty, and sentenced to be hanged, at Stirling, on Friday the 21st of February, 1812.' This sheet was published in Glasgow by Thomas Duncan. This broadside covers one aspect of a case which had its focal point in Stirling. The same day as Cain was tried for his part in a theft committed in Stirling, his two colleagues were hung also in Stirling, having been captured and sentenced previously. There are other broadsides in the National Library of Scotland's collection which detail the whole case. Although the English is a little difficult to follow, it transpires that Cain was caught because he could not resist showing his money off, and was then to be hung in Stirling, the scene of the crime.